Card is 2.5 x 3.5 in. 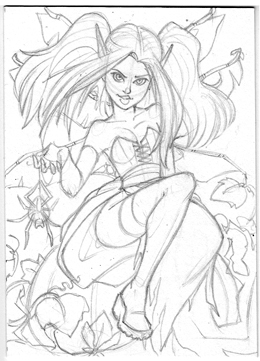 bristol (ACEO-size) The price reflects the finished piece, which will be inked and colored with marker and mailed to you. The one who purchases this card can dictate color information and may also name a few minor changes/additions to the image to suit your tastes. Sarah Aiston says: Great sketch !! Wish I could draw that well :)	~ Reply? Jenny Heidewald says: Eee!She is cool! I knew it was yours just from the thumbnail! ~ Reply? Sue Rundle-Hughes says: Wonderful! so much detail! ~ Reply? Carole Graham says: Awesome job! Would love to see the coloured version. ~ Reply?